Update Oct.8, 2014 – Ok, it’s crazier today than it was a year ago. 235 298 views of this page today alone because of pins of the above pic on Pinterest! Alright, here ya’ go folks, maybe this is what you’re looking for … Over on The Kitchen Prescription Sherri in Florida has worked throough a couple iterations of a recipe she calls “Copycat J. Alexander’s NYO (Not Your Ordinary) Mac n’ Cheese“. I haven’t made it, but the comments over there indicate she’s gotten quite close. I hope that helps! Ok, so it’s a ramekin full of macaroni and cheese. Big deal, right? Oh, you are soooo wrong … This is a serving of Not Your Ordinary Mac & Cheese from the J. Alexander’s location on Talmadge Road across from the Westfield/Franklin Park Shopping Center. We’re talking beautifully-made macaroni, swiss and other cheeses, bacon, handmade croutons … definitely worth more than the $4 we paid for this extra side dish. The salmon was grilled medium-rare, at our server Allie’s suggestion. I’d have ordered it that way anyway … Back in July I’d raved about the Gravad Lax at the IKEA store in Canton, writing “This is the kind of salmon that almost dissolves when you put it in your mouth.” Well, this grilled salmon was just as good, being light and flaky, bordering on ceamy with a little bit of buttery thrown in for good measure. The thinner edge carried a little more seasoning, and there was a more peppery flavor there. But the rest of the filet was so incredibly worth ignoring that one edge. The Orzo & Wild Rice, with its chopped red & yellow bell pepper, dried cranberries, slightly tangy vinagrette and served chilled, makes for an amazing side dish. I brought some home and will have it for lunch today. Mary ordered their Rattlesnake Pasta. There’s no rattlesnake in the dish. Rather, the linguini-style pasta noodles with peppers and southwestern spices are served with pulled rotisserie chicken that looks like lengths of rattlesnake. It was a wonderful dish. 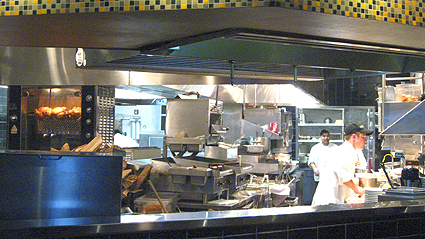 The open kitchen at the Toledo location of J. Alexander’s is fun to watch. Chickens are roasting in the rotisserie unit on the left, which you can see immediately upon entering the restaurant. A stack of hardwood firewood is near the rotisserie unit … all their steaks are grilled over a hardwood fire. Interesting to note is that a lot of their cooking surfaces, such as the grills just to the right of the wood, are countertop units, making the kitchen simple to reorganize to follow menu changes. 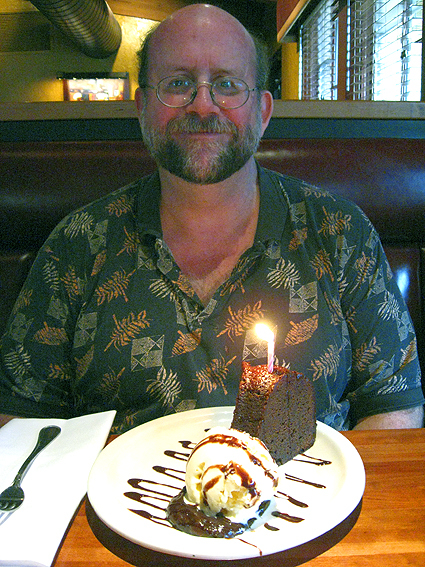 Of course I had to order their Very Best Chocolate Cake with Vanilla Ice Cream and Hot Fudge. As it was my birthday dinner, Allie had included a lit candle when she served my dessert. While sharing my dessert, Mary also had some Carrot Cake with Cream Cheese Icing to share with me. Served warm, it’s some of the best carrot cake ever. We’ll be going back sometime, oh yeah, we will. But any dessert will be requested as “sans candle“. Happy birthday! That mac n cheese looks soooooo good! Sounds like celebrating at J. Alexander’s was just meant to be. Your (food) photos just keep getting better—oh, and I kinda liked seeing the birthday boy, too. 🙂 Do you care to share your birthday wish? 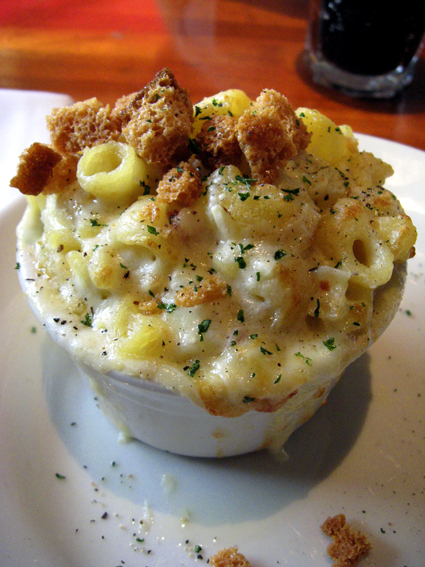 Can you get that fabulous looking mac-n-cheese as a main dish or does it only come as a side?? Shawna, the Toledo menu only shows it as a side dish. But with that kind of restaurant, it may be possible to ask for it as an entrée and succeed in getting it. I love it! It’s like a mac’ n cheese souffle. Actually, it might be interesting to make something like that, as a (dare I suggest it?) somewhat lighter version of mac n’ ch. Use the volume of the egg whites as replacement for some of that heavy cheese, but how would the pasta fit in? Might fall to bottom. I’m typing out loud here — but if I ever get a chance, I think this might be worth exploring. Oh and — HAPPY BIRTHDAY! You look so happy in pic, and after that meal, how could you not be? Nora I can’t believe you dared suggest that?? 😉 Mac ‘n cheese has such a distinct texture and satisfaction/comfort factor, I’m not sure a lighter version would really work for a lot of people. But hey, it could be worth a try! Happy Birthday Big Guy!!! Kisses from Knoah!!!!! Alright…so now the big question is: Can you duplicate that recipe of mac-n-cheese for me???! Pretty please? Come on, give it a whirl! i would love that recipe for the mac N cheese!!! any luck getting it or creating a “carbon copy”? Do you have the recipe for the mac and cheese? 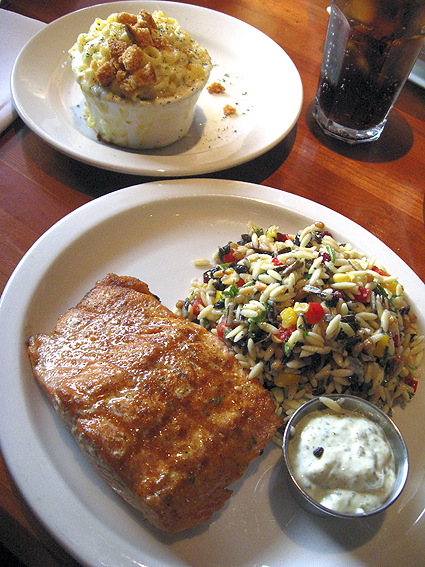 We have a J. Alexander’s near us and always bring home a side dish of this to have later in the week. It is abolutely the best mac and cheese ever! Ours has Gouda in it. No, I don’t, sorry! Even if I have such a thing, I end up modifying it somehow anyway. Just had to say hello. Someone pinned this on Pinterest and I was surprised to see this as…2 day ago was my husbands birthday and after not thinking it through that the restaurant I wanted to take him to would be mobbed because of a holiday event, we ended up at J Alexanders also. We are in Fort Lauderdale FL, but everything sounds the same. He had the Crab Cakes and I had the So Cal Burger (sometimes you just have to have a burger 😉 and of course a side of Mac and Cheese and Frites. Everything was amazing! I asked what was in the Mac and Cheese our server (Chad) told us it was onions and garlic sauteed and a Gruyere sauce. Ours did not have bacon, but did have bread crumbs on top. Well thanks for the story and loved how it mirrored ours. If i find a recipe close I will come back and let you know.